Winner of the final GreenHouse New Play Festival at HotCity this year, Lia Romeo’s clever take on the reality and non-reality of the so-called reality shows is a fresh look at the behind-the-scenes shenanigans of such a series that has become so popular on televisions across the country and around the world. 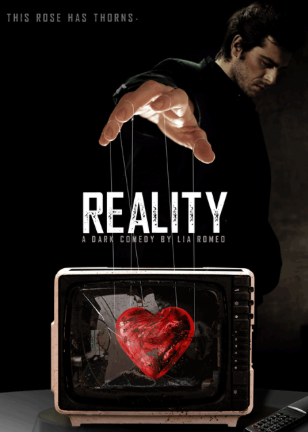 Anyone with half a brain knows there’s nothing “real” about reality television. So we take a trip into a show not unlike “The Bachelor” to see what happens when the cameras stop rolling. In a clever take on such shows, we see a “safe house” where the “winner” and her new found mate can get together in secret until the final show is aired and the public knows the outcome. But in a clever staging technique, each scene is announced and we get to see the “backstage” area on stage as everything is…well, staged. The frazzled producer of the show, Josh, is given a straight-forward approach by Ben Nordstrom. Focused entirely on the success of the show and its “believability,” he soon veers off course after some dramatic events change the real reality of the couple. The couple, Annie and Matt, are given powerful portrayals by Maggie Conroy and Tyler Vickers. She’s fallen for him- although we soon learn of her fickleness- and he’s just not into this whole marriage thing. Rounding out the cast is Julie Layton as the runner-up in the contest who just happens to live somewhat nearby the winner in the middle of Iowa. They become best friends on the show and then share the reality (or is it?) in the aftermath of Annie’s win. It’s one surprise after another as the crises unfold over the 90 or so minute running time. How serious are all of the participants in the show? Is the reality close to the reality we see on screen? What kind of special breed of people inhabit this weird world of reality TV? And finally, who is telling and living the truth? The search for instant fame and maybe instant happiness is not so real in front of or behind the cameras. Director Annamaria Pileggi oozes every sleazy moment out of the script and handles the fluctuating emotions of everyone in the cast with humor as well as pathos. She’s blessed with a marvelous cast of some of the finest actors in our town. They throw themselves into it and make us care and detest their characters in the ebb and flow of reality TV on stage. The clever Kyra Bishop set design allows us to see the opening scene of the final episode before the backdrop is hastily disposed of like yesterday’s news. A television monitor hangs above the stage area to help us remember that what we’re seeing is not reality. Then the multiple sets are magically transformed by the change of drapes, couch pillows, a few pieces of furniture along the way. The L-shaped stairs offer access to the onstage proceedings as well as the backstage look to remind us that nothing is as real as it seems. The Michael Sullivan lights add to the “reality” as the onstage area is always brightly lit but the backstage area remains in shadows as members of the cast and crew are often seen lounging, awaiting their next entrance. The sudden blackout, flash and return highlighting each scene is also a brilliant interpretation of what is going in in this script. Jane Sullivan’s costumes are beautiful reminders of our characters and the Patrick Burks sound design adds to the entire scheme. Reality TV stripped to the bare essentials shows what’s really behind these shows. People pledging love to total strangers and people fighting to keep the “reality” alive are all part of the scenario as it becomes a battle for survival and ratings. 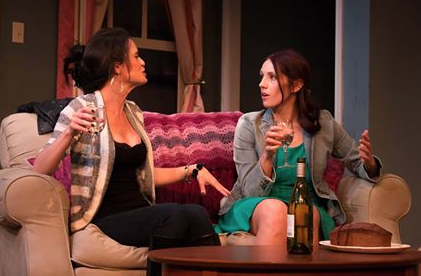 “Reality” plays at HotCity through December 20th and it’s highly recommended for a clever script and a powerful acting ensemble. Give them a call at 314-289-4063 or contact them at hotcitytheatre.org and become part of the history of this wonderful company as they end a long and illustrious run in our area. This entry was posted on December 16, 2014 at 9:43 am12 and is filed under Uncategorized. You can follow any responses to this entry through the RSS 2.0 feed. You can leave a response, or trackback from your own site.